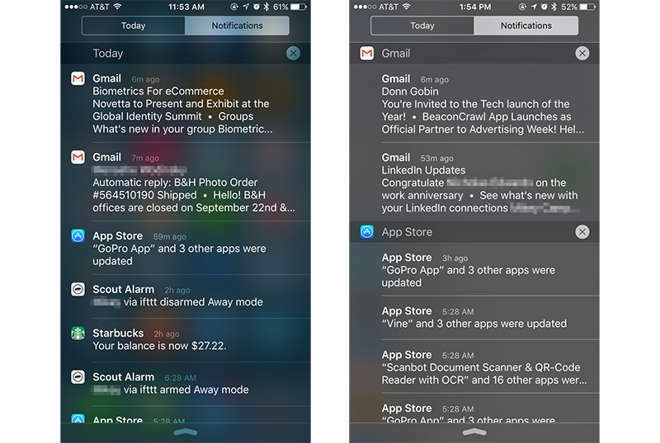 Notification Center with Group By App deactivated (left) versus activated. Since inception, Notification Center sorted alerts by apps and time, but the system was somewhat clunky. Even if users opted to sort by time, notifications were perpetually presented according to their respective originating app. Depending on how often you checked and cleared your notification timeline, receiving an email could have potentially pushed a text message or other important alert down the screen. iOS 9 carries over the same app and time sorting capabilities (now called "Recently" and "Manual"), but solves previous issues by adding a third option in Group By App. Turning this feature off breaks alerts out into freestanding notifications displayed in Notification Center's cascading timeline. 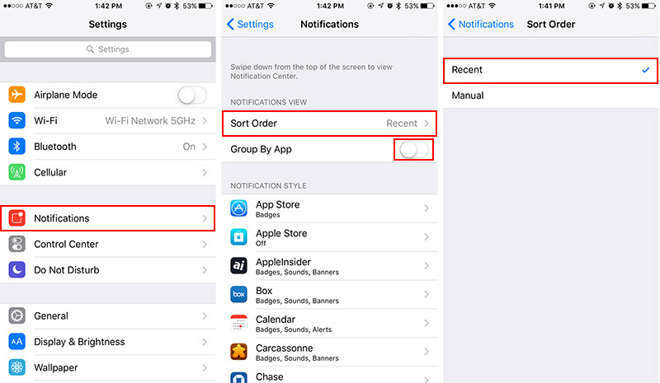 To switch away from app groupings, navigate to Settings > Notifications > Sort Order and select Recent. Back in the Notifications settings menu, toggle the Group By App button to the off position. Confirm the change in Notification Center by swiping down from the top of your iPhone or iPad screen. Users can revert to legacy notification handling methods by selecting Settings > Notifications > Sort Order > Recent and activating Group By App. You can also choose a strict sort order always grouped by app by choosing Settings > Notifications > Sort Order > Manual. For example, if Messages is at the top of a sort list set to Manual, notifications from that app will always appear first in Notification Center, regardless of arrival time.